Odd I should actually read a paperback rather than a Kindle version, but this was on a super-sale and I couldn’t resist. And although Desai has been widely acclaimed for her novels of India, I’ve never read anything by her – glad to read this. I have read two books by her daughter, Kiran Desai. 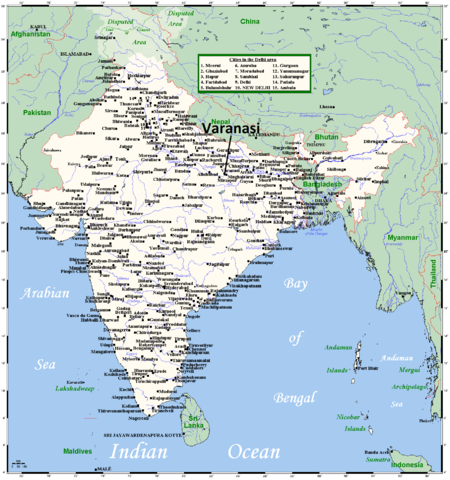 This is the story of a prosperous Indian family in Varanasi, India which is located in the northern part, near the Ganges River. There are two main Parts to the book. The first Part is about the parents and especially the older girl, Uma. In this part a boy, Arun, is born after the parents thought there would be no more children. The point is to compare life for young adults in India with each other as well as with life in America in many ways. Food, as indicated in the title, is the important thing to compare. What do we (or the characters) eat? Why? When? Who prepares the food? What does it do for us or to us? Is eating with others a way of seeking communion in some way? In what ways are we (or the characters) hungry? It’s an incredible theme. The book starts out with the parents and their two daughters. This Part is mostly the story of Uma the eldest, plain, clumsy, intellectually dull and eventually home-bound spinster. She also seems to have epileptic fits and The other daughter is Aruna who is beautiful and graceful and smart. The goal of the parents is to get these girls married off – into good circumstances. But the convent school introduces the importance of religious experience in Uma’s life. Also, Mira-masi, the visiting widowed auntie, brings stories of distant family members as well as of the Hindu religion. Uma loves the stories and imitates Mira-masi’s diet and puja (Hindu religious rite). 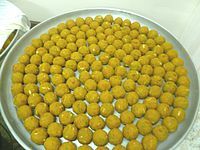 Mira-masi also makes and brings an excellent dessert, ladoos. Another visitor is Ramu-Bhai, a handicapped and black-sheep nephew, who takes Uma out to dinner and gets her drunk and is involved in other pranks. Ramu’s sister Anamika, as good as Ramu is bad, is the first of the cousins to marry – her life is miserable. 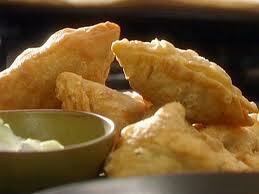 Food is present at almost all the family gatherings. They eat together and the food is prepared by the scrupulously clean cooks, although the auntie makes and brings special treats. The most important thing seems to be getting the daughters married and Arun off to a university but the River Ganges plays a hugely important symbolic role. “At an Old Drawer” by Ella Wheeler Wilcox. The rest of the lines are from “The Sea-Breeze and the Scarf” by the same poet. Why is this there? Is Uma mourning her lost life? This book deserves a second reading! Part 2 concerns Arun and his life in Massachusetts where he attends a university. Summers he spends with a Christian family introduced in Part I. The food does not suit him – many things don’t suit him. He’s a loner, really doesn’t want to get involved with people for some reason. The boy is dying of starvation for people. His student- sister is anorexic. The father and son in the student home are aggressively carnivorous, while the mom loves to buy food but tries to eat vegetarian. I think the title indicates the basic theme of the book. I don’t remember much about fasting in India, I think it was controlled and for religious purposes. (As I said, the book deserves a second reading!) In the US fasting was not really an acceptable thing to do – and in Melanie’s case it was an indication of a serious dysfunction – the girl is badly anorexic. Also the feasting in India seems to be controlled, there were these little things and those little things from so & so – to be eaten like this or that. The family in India does not cook – the cook cooks and the family eats (except for the Auntie who brings treats sometimes). 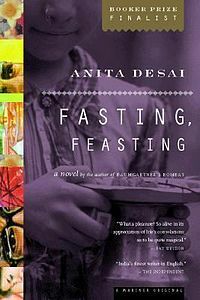 In the US the family Arun stays with feasts all the time without knowing it – except Melanie who starves. Mom loves to shop and she shops and she cooks sometimes but usually everyone is left to their own devices to fix whatever they want from the freezer or storage. Lots and lots of meat for the men, Mom wants to eat Indian style – lots of veggies – Melanie eats candy and throws up. Arun has no idea how to cook the food he eats at home. The cook cooked and they ate vegetarian which means he’s not going to eat a lot of meat in the US. I was struck by the way that the feasting and fasting also seemed to apply to emotional health. Melanie was starving emotionally as well as physically. The US guys were bonded on a “manly” level with a lot of meat and sports. Mom wanted desperately to “bond” with someone – she’s terribly lonely – so she tries to “eat with” Arun but that doesn’t turn out too well for him. Mom bonds with her family by shopping for their food – whatever they eat is okay. Arun is also starving emotionally but it’s from his own reluctance to bond with anyone – he doesn’t want any emotional connections – he’s never had any with his family – they just pushed him to succeed. In this way – voluntary starving in one way or another – he’s like Melanie. Uma and Aruna, Arun’s sisters are starving for emotional connection but they don’t have a clue – they are also expected to succeed but for them that means to marry well > period. Aruna marries but it’s not “well,” she’s treated horribly and dies. Uma is so unattractive as a marriage partner that she is only used by scam artists to get her dowry. She has one cousin, a black sheep, who accepts her but he tries to make her into a drinking buddy (I think). The Auntie is loving toward Uma – these may be both doing it out of pity. Uma is a pitiful character except when she’s at the River. Uma’s redemption comes from the Ganges River. I don’t think any of the other major characters find that. I think this book may really be about communion (eating together) and redemption (being absolved or saved). The family in India finds a communion of sorts when their Auntie brings the sweets she makes. In the US family only the men find it in their meat-heavy barbecues. “Aruna marries but it’s not “well,” she’s treated horribly and dies.” This is Anamika, uma’s cousin, not Aruna. Oh my, you’re right! Thanks for catching that.